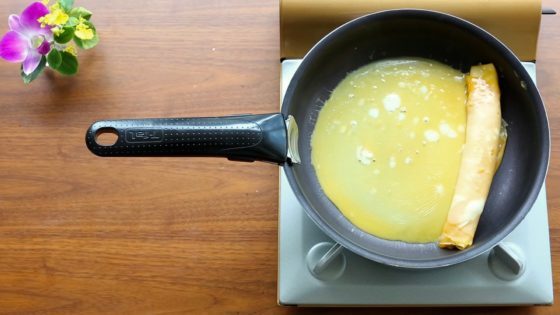 Here I shall show you a recipe for making a Japanese omelette known as Dashimaki Tamago. 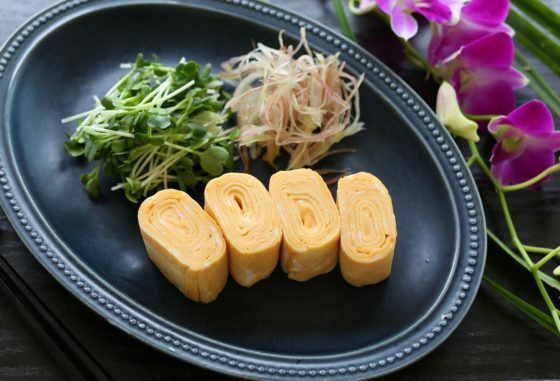 Dashimaki Tamago was invented by the popular French chef from Japan, Hiroshi Mizushima. 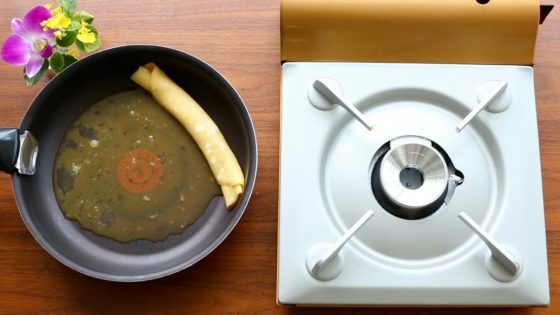 Dashimaki Tamago is generally made by mixing eggs with a dashi stock made from konbu kelp and dried bonito flakes. However, this Dashimaki Tamago is made with water, instead of dashi stock. Using water, rather than dashi stock, makes the flavor of the egg stand out, making the omelette much more soft and juicy. 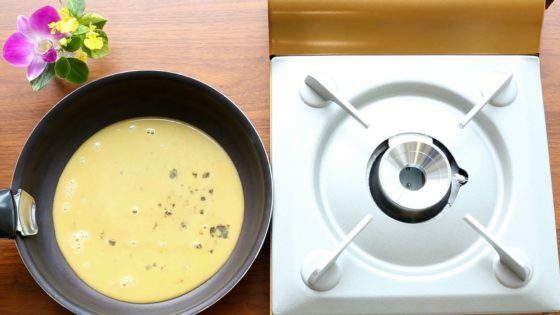 This is an omelette that can be made easily using a standard frying pan. This is a recipe for making Dashimaki Tamago. Crack the eggs into a bowl and beat them thoroughly. Mix in the salt, sugar, and soy sauce. Add some salad oil into a cold frying pan, and pour in some of the egg mixture from Step 1 to make a thin layer. Place the frying pan on a low heat. Wait until the egg is cooked enough so that it does not move around even when the frying pan is tilted. Then take the frying pan off the heat, and use a spatula to roll the omelette. Add a bit more of the egg mixture to the frying pan, and wait until it is cooked to the same consistency as Step 2. Take the frying pan off the heat and roll the omelette. Repeat this process until you have used up the whole of the egg mixture. 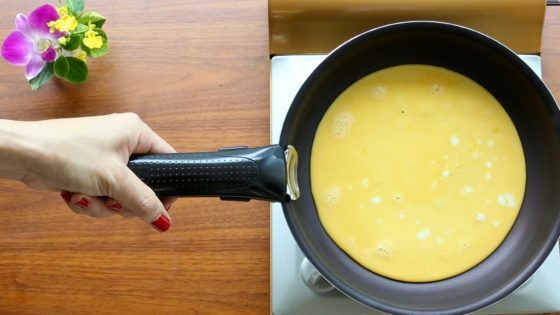 Place the cooked omelette from Step 3 on a rolling mat or sheet of aluminum foil, and roll the egg to make it into a neat shape. Wait until it has cooled down a bit. Your Dashimaki Tamago is now ready. First, crack three eggs into a bowl, and beat them thoroughly to create a smooth liquid mixture with no lumps. By the way, people say that the most effective way to beat eggs is to use a pair of cooking chopsticks, moving them left and right really fast, in a straight horizontal line. There are many professional chefs that say that you can get a better flavor if you do not beat the eggs too much. However, Chef Mizushima does beat them thoroughly. Then add salt, sugar, and soy sauce to the egg mixture. This Dashimaki Tamago does not contain any dashi stock. By using water, instead of dashi stock, you can make a Dashimaki Tamago that has a much better flavor and texture. Adding liquid to the egg makes its flavor stand out more, helping it achieve a much softer texture. However, using water instead of dashi stock makes the egg taste even better, also creating a much softer texture. Next, add some salad oil onto a cold frying pan, and pour some of the egg mixture to make a thin layer. Make sure to add only enough of the egg mixture to cover the bottom of the frying pan. The recipe says to add a relatively small amount of salad oil, 0.4g. 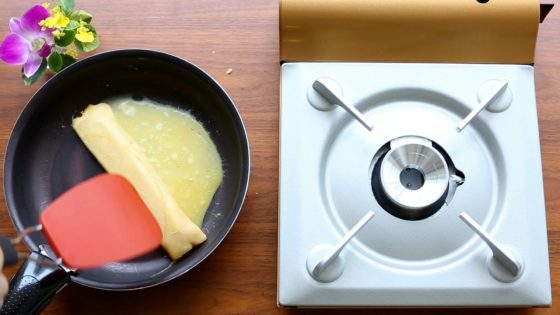 However, another good alternative is to soak some kitchen paper with an appropriate amount of salad oil, and then use it to coat the surface of the frying pan. I recommend using a relatively small frying pan, measuring around 22cm. Once you have poured in some of the egg mixture, place the frying pan on a low heat. 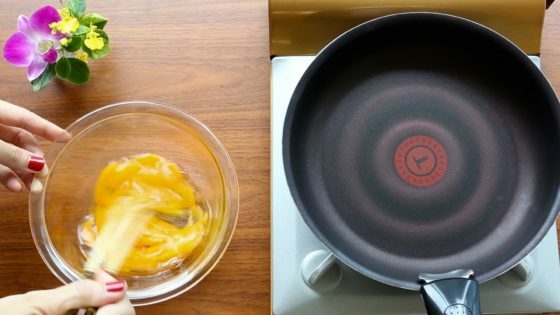 Cook the egg until the mixture stops moving around even when the frying pan is tilted, as shown on the photo above. Take the frying pan off the heat. Make sure not to overheat the egg. The egg should be hardened gradually. Take it off the heat when the mixture stops moving around. In this way, your Dashimaki Tamago will come out soft and moist. Cooking the omelette over a low heat prevents the egg from hardening too quickly, so you are more likely to end up with a successful dish. Take the frying pan off the heat, and use a spatula to roll the cooked egg. Once you have taken the frying pan off the heat, you will have plenty of time to roll the omelette, without any need to rush. Next, pour some more of the egg mixture into the frying pan. From the second time onward, make sure to pour a slightly smaller amount of the egg mixture than the first time. Cook the egg until it is of the same consistency as the first time, and use a spatula to roll the omelette. Repeat the same steps (pour some egg mixture, cook lightly over a low heat, take off the heat, and roll) until you have used up all the egg mixture. 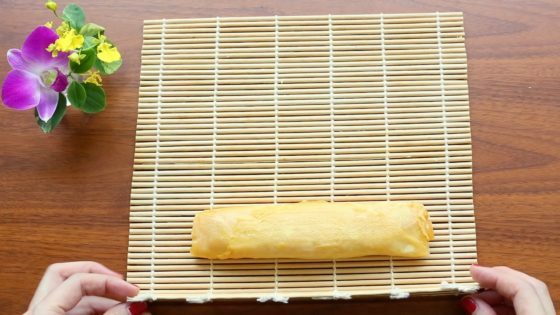 At the end, roll the omelette using a rolling mat or sheet of aluminum foil, to make it into a neat shape. Wait until it has cooled down a bit. Your Dashimaki Tamago is now ready. Cut the omelette into chunks that are easy to eat, and arrange them on a plate. 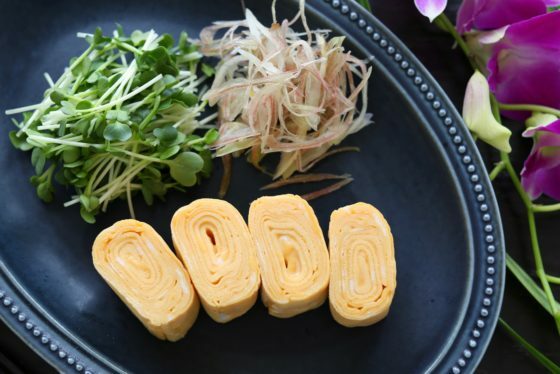 You can now make some Dashimaki Tamago with a deliciously rich egg flavor. This Dashimaki Tamago not only has a really soft texture, but it also has a deliciously springy quality. It will remain really moist, even when eaten cold. There are many Japanese people who tend not to make Dashimaki Tamago at home because they do not feel confident about the rolling process. 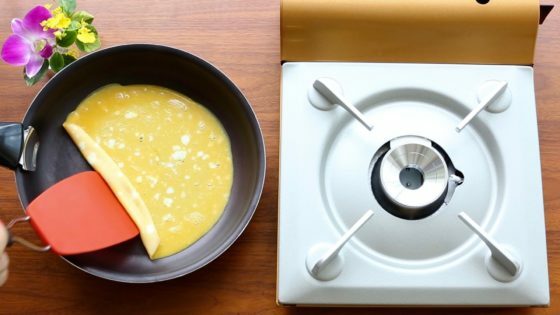 However, by following this recipe —taking the frying pan off the heat to roll the egg slowly— you can actually have a lot of fun making some beautiful Dashimaki Tamago.